The National Thoroughbred Racing Association (NTRA) announced today that Kentucky Downs in Franklin, Ky., has been fully accredited by the NTRA Safety and Integrity Alliance following a complete review of all racing operations at the facility. 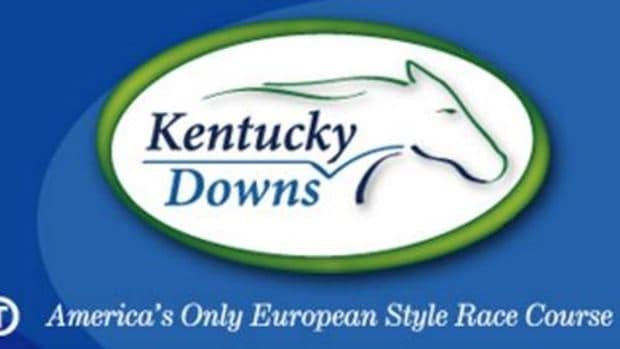 The accreditation of Kentucky Downs was the culmination of a lengthy certification process that began with the track’s completion of a 48-page written application and continued as Kentucky Downs hosted several meetings with Alliance officials. The on-site review included inspections of all facets of the racing facility, and interviews with track executives, racetrack personnel, jockeys, owners, trainers, stewards and fans. The inspection team was comprised of Ronald Jensen, DVM; Mike Kilpack of the Organization of Racetrack Investigators (ORI); and Mike Ziegler, Executive Director of the NTRA Safety and Integrity Alliance. “Kentucky Downs was reviewed during its most recent live meeting in September 2011,” said Ziegler. “It received ‘Best Practice’ ratings in many areas including pre-race examination protocols; post-mortem veterinary examinations; maintenance of the veterinarians’ list; use of the cushioned riding crop and safety vest; padded starting gate; substance abuse and addiction protocols; infectious disease management; testing for alkalinizing substances; out-of-competition testing; security protocols; medication and testing education; and a host of wagering security procedures including stop wagering mechanisms, simulcast contract language, elimination of cancel delays, exclusion of pools when non-verifiable, timing display and synchronization on video broadcast and totalisator; state-of-the-art tote technology; and wagering incident investigation protocols. Kentucky Downs is now the 24th racing facility to receive full accreditation, joining Churchill Downs, Keeneland, Belmont Park, Delaware Park, Hollywood Park, Monmouth Park, Arlington Park, Saratoga Race Course, Calder Race Course, Turfway Park, the Del Mar Thoroughbred Club, Oak Tree at Santa Anita, Fair Grounds, Aqueduct Racetrack, Golden Gate Fields, Woodbine, Pimlico, Canterbury Park, Sunland Park, Finger Lakes Casino and Racetrack, Suffolk Downs, Santa Anita Park and Gulfstream Park.